Pump It Up of Frederick, the leader in the children’s entertainment category specializing in private, indoor birthday parties for kids of all ages. From our indoor giant inflatable filled play areas, to our private party room, our staff takes care of everything for your event; all you have to do is coordinate a group of kids who want to have an awesome time! 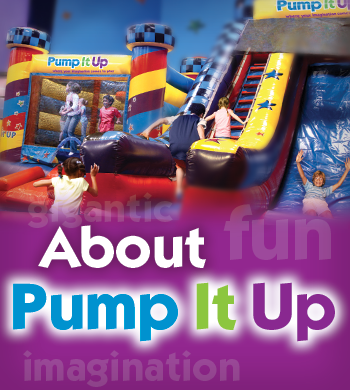 Pump It Up of Frederick is locally owned and strives to be an active member of the Frederick County community by sporting local schools and civic organizations. In addition, we host events to support and inspire our special needs community through our Great Open Jump, Sensory Santa, and monthly Sensory Jump times. Since opening in 2011, Pump It Up has donated countless Open Jump passes and free parties to support local schools, PTAs, and community fundraising efforts amounting to well over $80,000.